Due to their characteristics, cast alloys enable the use of large-scale casting procedures (pressure casting and casting in moulds) with high productivity. 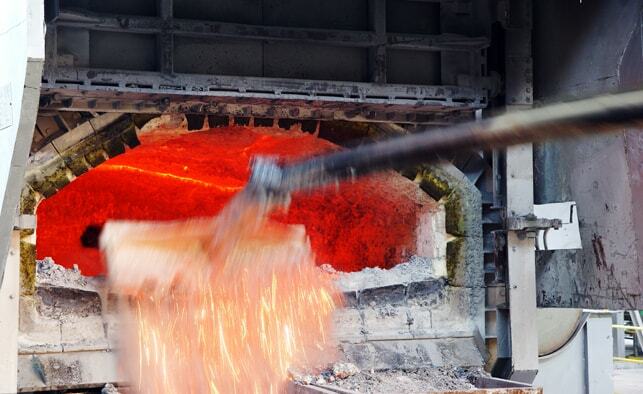 We produce them in the form of cast ingots and mould cast ingots. The characteristics of cast alloys are low specific weight, good corrosive resistance, good workability, clear and smooth surface and non-magnetic properties. We produce all main types of cast alloys. As alloy elements mostly silicon, copper, magnesium, zinc and manganese are used. In the reverberating furnace hard aluminium is melted. The energy sources are natural gas and the warmth of aluminium, produced through electrolysis and heated up to 900 °C, which is derived with special pots from the electrolysis and transferred into the reverberating furnace. In accordance with the chemical composition of the alloy, alloy elements are added. To decrease the sodium content or the content of other undesirable elements, salts are added, while a homogeneous chemical composition is achieved by mixing the melt. The treatment of the melt is continuing during the casting process. To decrease the content of hydrogen a flow-through filter is used, which is connected through the oven with a groove. In the flow-through filter the inert gas argon is blown into the run in melt through special stirrers. Argon forms very small gas bubbles, which rise towards the surface of the melt and capture hydrogen and other undesired impurities. The melt is continues its way from the flow-through filter through a ceramic filter in which inclusions are extracted (oxides, borides, carbides, fluorides, chlorides...). In a launder, modifiers are added in the melt (wire AlTiB), which during the coagulation of aluminium positively affect the growth of crystal grains and improve mechanical characteristics of cast alloys. The melt is transported through the system of launders to the distribution groove, where the moulds for continuous casting can be found. The set includes three moulds with eight castings per each mould, which enables the casting of 24 continuous cast ingots at once. Moulds are cooled down with cooling water from a closed cooling system. 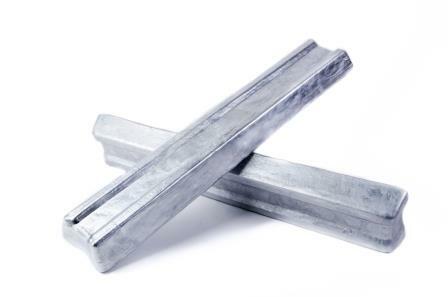 The continuous cast ingots are sawn to precisely determined lengths. They are piled with an automatic forklift and bonded into a compact band. The melt is transported through the system of launders to the casting machine for mould cast ingots, where individual moulds are being filled with a casting wheel on an endless casting belt. These moulds are cooled down with cooling water from a closed cooling water system. Behind the casting machine is an integrated air refrigerator in which the mould cast ingots are cooled to ambient temperature. Mould cast ingots are piled with an automatic forklift and bonded into a compact band. According to the definition in the Dictionary of the standard Slovenian language a billet is a long, level object, generally round in its section. An aluminium billet is an intermediate product for the industry, which produces a wide range of products, mainly aluminium profiles, with various processes of plastic transformation (mostly with extrusion and forging).